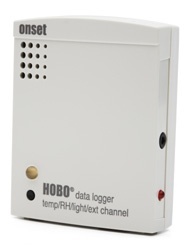 The HOBO U12 Temp/RH/Light/External Data Logger contains internal sensors for monitoring three common indoor parameters, as well as 3rd party sensors when using the 4-20 mA cable. A fourth channel accepts a wide range of external sensors, including temperature, AC current, AC voltage, CO2, 4-20mA, and DC voltage cables. Light Intensity: Designed for indoor measurement of relative light levels.